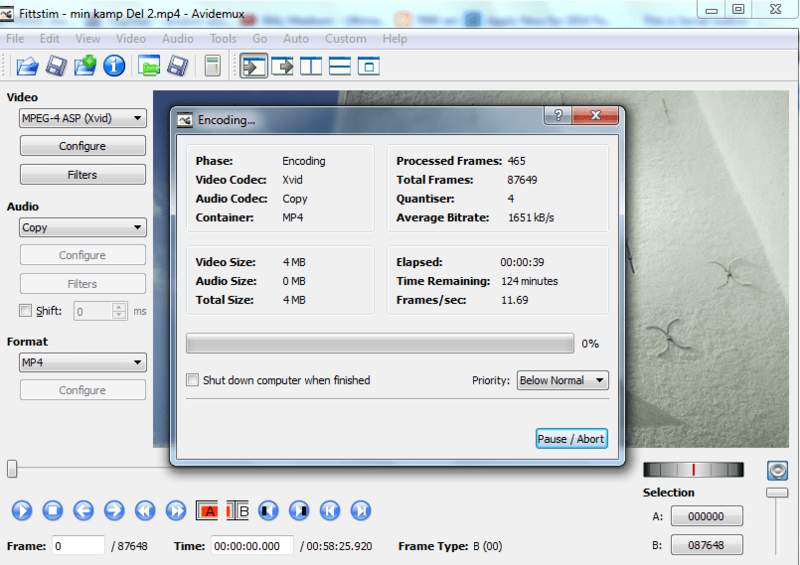 Subtitling a video clip is a serious business and it takes a lot of time. If you are sure you want to do that, read this page carefully and then start working on subtitling in order to bring men’s issues closer to your community through subtitled clips. This is the Swedish documentary Könskriget (The Gender War) subtitled in Romanian. As you can see, the subtitle is automatically embeded into the clip. This is the most efficient way to do it because it eliminates any compatibility problem that can occur when you’re using an external subtitle (a feature that Youtube, for instance, allows it through the CC option). It also makes your subtitle safe because nobody can steal it and pretend it’s theirs (which unfortunately it is fairly common in the subtitling community). In this tutorial, we’ll teach you how to make a subtitle like the one in the example. In making a subtitle like this, there are two major steps: Making the subtitle and embedding it into the clip. Before, getting to the two steps, you need to download three pieces of software: Avidemux, Jubler and BS Player. Avidemux and Jubler are open-source pieces of software so you don’t need to worry about the licenses. BS Player is a proprietary software but, as you can see in the download page linked, it also allows a Free version of it which is enough for what you need here. After you downloaded and installed these three pieces of software, you can proceed to actually create the subtitle. We recommend downloading the 32-bit version of Avidemux since it’s more stable, even if you’re using a 64-bit system. You will notice an icon called “Jubler Subtitler Editor” on your desktop. Double click on it and open Jubler. Once you opened it, press CTRL+N, or click the first icon in the menu bar (upper left side of the window). After selecting these, choose a saving location for the subtitle. It’s recommended that you choose the same location with where you have the clip that wish to subtitle. In that way, you can test your subtitle with BS Player far easier. 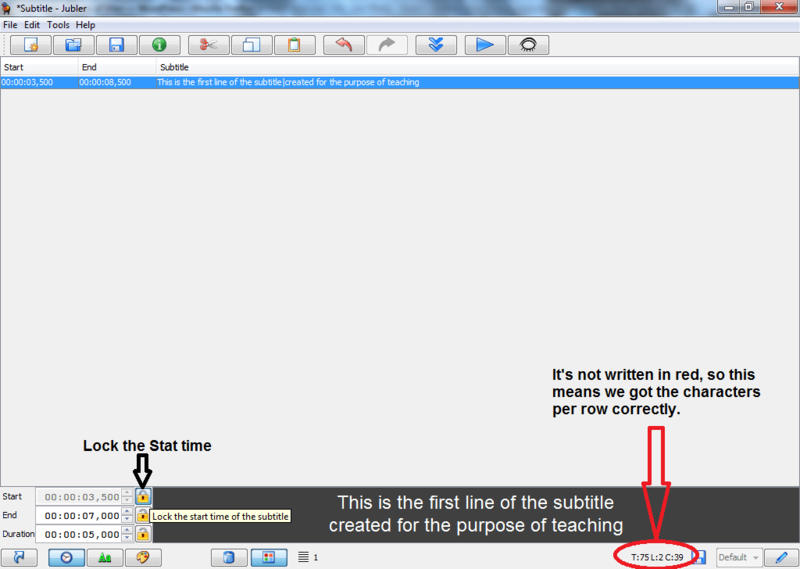 Now, once you did that, you can start writing your subtitle, line by line. Once you’re done writing one line, press CTRL+Enter on your keyboard to go to the next line. Each line of your subtitle can have (in theory) up to 7 rows. For esthetic and reasonable readability purposes, it’s recommended that you use no more than 3 rows per subtitle line, though two rows is the best way to do it. 3 rows should be used only if the speaker in the clip talks so fast (or says so many things that require more words in your language) that you can’t do it without using three rows in a subtitle line. To move to the next row in the same subtitle line just press enter. Although it’s not a deal breaker, it is recommended that you keep your subtitle rows under 40 characters. Going over 40 characters per row will turn that subtitle line red when viewing it in Jubler and, most importantly, can create additional issues when embedding it into the clip in step 2 (Such as as some letters not appearing into the clip). Once you wrote the line, make sure you select the Start time and the End time of that line. The Start time and the End time represents the time period in which what you wrote in the line appears on the screen. It is recommended that you first select the Start time and lock it (by clicking on the lock near it) and then select the End time. The Duration will set itself by making the subtraction between the end time and the start time. In most cases, you won’t need to edit the Duration time at all. In the image (click to enlarge) we have the text This is the first line of the subtitle created for the purpose of teaching written on two rows that is set to appear in the second 3.5 of the clip and stay on the screen until the second 7 of the clip. As long as the Ts, L and C indicators beneath the text are written in black, it means we got the number of characters correctly and thus perfectly embeddable within a clip without any problems. Once you’re done editing a subtitle line, just press CTRL+Enter and it will move to the next line. You will notice that by default, your next line will be set to begin 0.5 seconds after the end of the previous one (in our example case – at the second 7,5). This is useful sometimes (e.g. when you have someone holding a speech and speaks very clear, with few words per minute), but not when you have someone speaking fast or when you have periods in the clip where nobody speaks and there’s nothing to translate. Therefore, you have to lock the End time and edit the Start time according to your needs and then lock the Start time again and repeat the process described above. You can even edit the start time to begin immediately after the last one. In our example, we can select the next line to appear at the second 7,001 until the second 11 and the Duration will automatically set itself at 3,999 seconds (see image). This example will show the phrase This is the first line of the subtitle created for the purpose of teaching people how to create subtitles in their native languages for various clips. starting from the 3,5 second until the second 11, split into two lines. It is recommendable that you get into the habit of pressing CTRL+S (like when editing Word documents) each time you’re done editing a line. 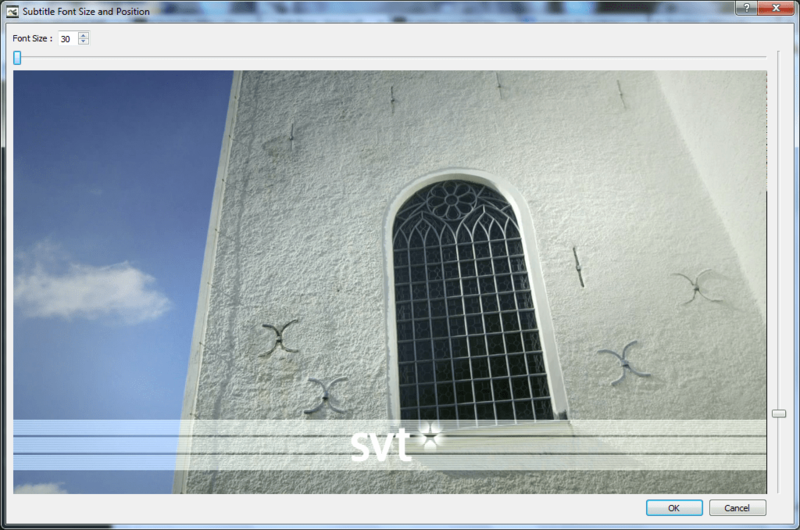 To test how the subtitle looks like at any moment, open your clip with BS Player. This is the reason we recommended placing the subtitle in the same folder you have the clip – so the subtitle can load automatically. Nota bene: Some accented characters (e.g. ö, å, ș, ț, ç, etc.) might look bad in BS Player. Don’t worry about that. As long as you selected the UTF-8 encoding when you saved the subtitle in Jubler, it will look OK when you embed it. Opening the clip with BS Player is only to test how well synchronized is your subtitle so far and to spot spelling errors. That’s all there is to know about creating the subtitle per se. Just repeat the steps described above until you have the subtitle in order. It seems simple but you have to actually listen carefully every line in the clip (in many cases multiple times) and make decisions regarding how to adapt the speaker’s speech in order to fit with the character limitations of a subtitle. One thing that all translators know is that all translations are, in fact, the translation and the adaption of a text or speech – and this is particularly true when making a subtitle where, unlike when just publishing a translated article, you don’t have unlimited space to thoroughly explain what the author meant. Very important: The last line in a subtitle is often times ignored by Avidemux when embedding. So please make sure that you create an additional line in your subtitle after you wrote everything that needed to be written in the subtitle. This way, the additional line will be the one ignored and not your last line that you wanted included in the clip in the first place. Before going to step 2, there’s one more thing you need to do: Copy the file Arial.ttf from the Fonts folder to another more accessible folder (in Microsoft systems it’s usually located in C:\Windows\Fonts). This is necessary because the Fonts folder has special permissions and it’s both harder to access it from there and it takes longer to explain how to work around those permissions. Once you’ve created the subtitle and you’re satisfied with how it’s synchronized, open Avidemux (icon Avidemux 2.5 (32-bit) on the desktop – in most cases) and import the clip you want subbed. 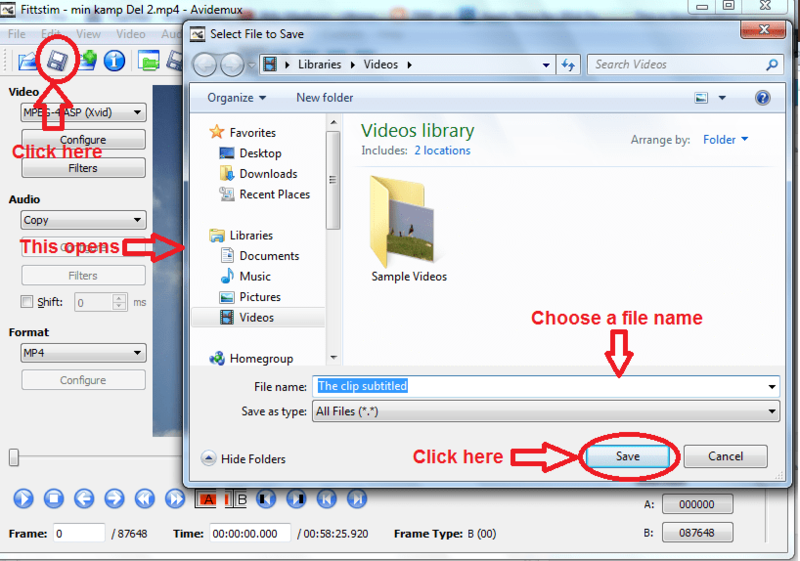 To import the clip use File -> Open or simply drag&drop the clip from Exporer. In some cases, you will get a message saying H.264 detected and asking you whether Avidemux should use another mode or not. We recommend you click YES on such messages to avoid crashing your machine (which is likely to happen given that most personal PCs today aren’t fit to work with editing H.264 files – especially large files). In other cases, you might get a message saying Index is not up to date asking you whether Avidemux should rebuild the index now or not. We recommend clicking YES on such messages as well to avoid troubles with re-encoding the clip after inserting the subtitle. After you clicked YES, just wait until the clip loads (which can take up to 2 minutes if the index needs to be rebuilt – otherwise it should not take more than a few seconds). Once the clip has been opened, there are some settings you need to do. First of all, select the Format to MP4. Leave the Audio on Copy mode and for Video select MPEG-4 ASP (Xvid). See the image to check how it is supposed to look. Explaining why the settings should be these ones and not others could take thousands of words. The short version is that we want the clip with the sub embedded to occupy as little space as possible on the hard drive and be as portable as possible so we can upload it virtually everywhere without spending hours to upload it and share it. Besides, some venues have a limit with regards to how big a clip can be (Vimeo for instance has a 500 MB limit) so even if you have a strong computer and a strong Internet connection, you should still use these settings which make a decent balance between keeping the original quality of the clip, embedding the subtitle and making it portable enough to be uploaded around the Internet. Once you selected these settings, click on the Filters button as shown in the image above. In the Video Filter Manager window that opens, choose Subtitles from the Available Filters column and then double-click on Subtitler from the second column. 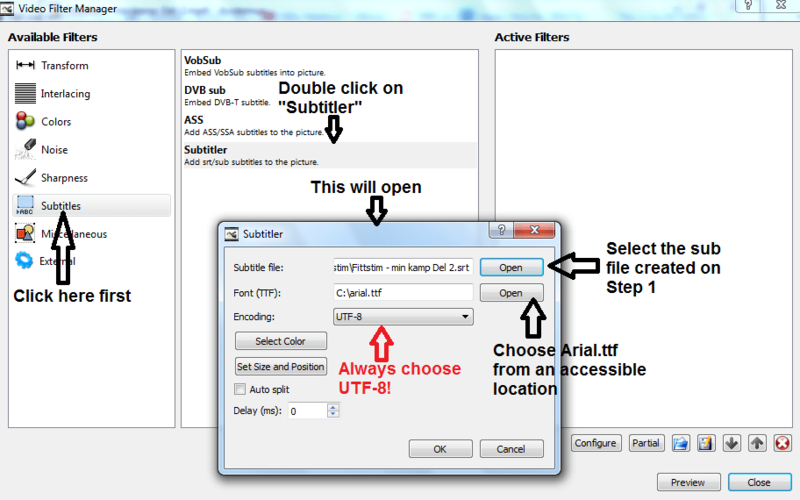 This will open the Subtitler menu(see image). 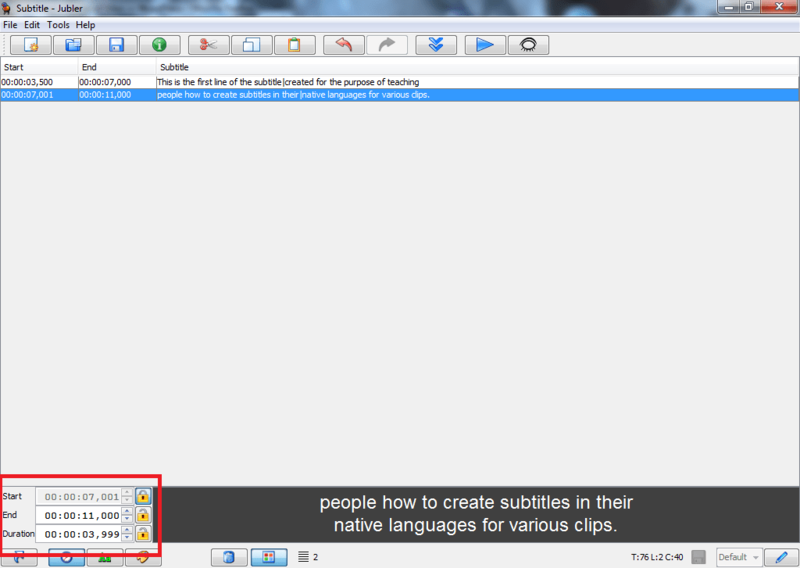 In the Subtitler menu, you need to choose two files: The first is the subtitle you created in the step 1. The second one is the font that it’s going to be used to show the subtitle in the clip. We recommend using Arial (the font stored in the Arial.ttf file) for the simple reason that this font is one of the friendliest fonts when it comes to accented characters and thus the problem with improper display of those characters is avoided. If you’re subtitling in English, this won’t be a problem – but if you’re subtitling in Portuguese, Spanish, Swedish or any European language that’s written with a Latin-based alphabet, then you’d want to use Arial as a display font. Also notice that you have a Select Color button in this window. White is the default color that comes with Avidemux but, as seen in the example place at the beginning of this tutorial, yellow is a better choice because it’s visible on virtually any sort of image. Th e last setting you ought to do in this window is Set Size and Position, which can be set by pressing that button. Now, the size of the font depends quite a lot on how you formatted your subtitle (e.g. whether you respected the 40 characters/row limit or not) and also from other different factors (e.g. the width of the original clip). As you get experienced, you’ll notice that it all depends on the clip and you’ll have to adapt accordingly. What’s important to remember is to set the position of the subtitle a bit higher than the lower limit of the clip. This is particularly necessary given that many video streaming services sometimes scale the clip and make the lower limit hard to view in a normal stream. Once you’re done with this, click OK both in this window and in the Subtitler window and then click Preview in the Video Filter Manager to see how your subtitle will look when embedded into the clip (see image). In the example in the image, we selected the size 46 and the position as described above so as to leave room both for a third row in the subtitle line (if necessary) and to leave room for the usual scaling of the stream services. We notice in the example that the accented characters look great and the yellow color fits the image. 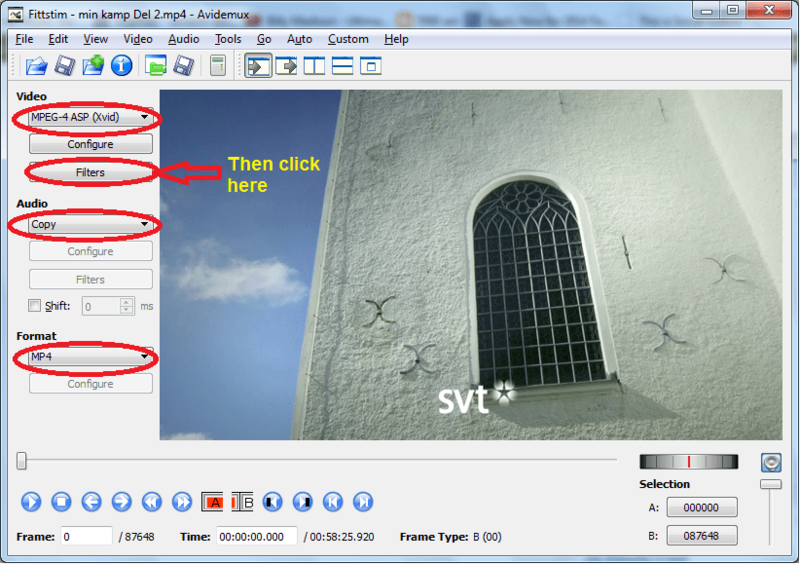 Use the cursor to look through the clip and see how the subtitle looks in various frames. If you don’t like how it looks, click OK and repeat the steps above (double click on Subtitler and change the color, the size, the position, etc.). If you like how it looks, then click OK and then click Close (the button next to Preview). Now one more thing needs to be done: Saving the clip with the subtitle embedded into it. Once you click Save, the encoding process will commence. Depending on the length of the clip, the resources your machine has, as well as the quality of the original clip, this could take between 10 minutes and up to 5 hours, or even more for High Quality clips that are over 2 hours long. We recommend that you close all your other applications besides Avidemux (especially Skype and the browser!) while the clip encodes. This is both to boost the speed with which it encodes and to spare your CPU of unnecessary usage. If you feel it takes too long, you can start encoding it right before you go to sleep and tick the Shut down computer when finished option. After you closed all your other applications, you could also increase the process’ priority from Below Normal (which is the default – see image) to Normal or Above Normal. We don’t recommend using the High option as it just puts an unnecessary additional burden on your CPU without actually increasing the speed with which the clip is encoded. Once the process is done, go to the location where you saved the file and play it. If you followed the steps correctly as described in this tutorial, it should look just fine for you to upload it on youtube/vimeo/etc as your subtitled video. 1. To subtitle a video you need Jubler, Avidemux and BS Player. 3. Write the subtitle using no more than 40 character per row and no more than 3 rows per subtitle line and synchronize it with the clip. Test the synchronization using BS Player. 4. Make sure you have an additional line at the end of the subtitle so Avidemux won’t eat the last line. 5. Copy Arial.ttf into a more accessible location and open the clip with Avidemux. 6. Set MP4 format and MPEG-4 ASP (Xvid) video codec. 7. Go to Filters -> Subtitles -> Subtitler. 8. 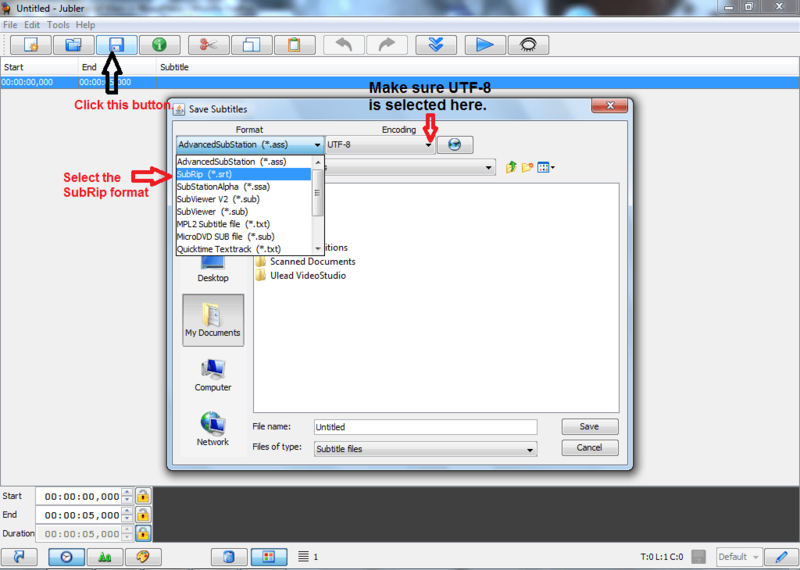 Import the font (Arial.ttf) and the sub file created and then select the size, position, color and the UTF-8 encoding. 9. Preview all the settings and fix the problems if they exist. 10. Save the new video file. Final note: The aspect described in this tutorial definitely do not represent the only way of making subtitles, or even the best way. They do describe, however, the best conclusions drawn by the experience of a team of 8 subtitle creators with an experience of a decade in this field. That being said, good luck in making subtitles! Spread the word!